No motorized tool can even come close to the quality of work a hand plane will do. Mighty strong words, you say, for a tool that's been around for the past 2,000 years. But it's true. And I think it's kind of refreshing to know there's at least one tool in the shop that doesn't have to be "plugged in" to do its job. Yet, hand planes seem to intimidate many woodworkers. This fear is usually based on the feeling that hand planes require a tremendous amount of skill to use. Actually, it just takes a lot of elbow grease. The real skill involved with a hand plane is adjusting it so it does what you want it to do. The entire family of planes consists of hundreds of individual styles. But all of these planes can be grouped into two basic categories: bench planes and specialty planes. Speciality planes are made for specific purposes (cutting rabbets, or grooves, or molded edges). Although some of these planes are still manufactured today, they are, for the most part, collectors' items. Bench planes are the ones used to smooth the* surface or edge of a board. (Nowadays that means most of the work done by hand planes.) Bench planes are divided into four basic styles (lengths). The only real difference among these four styles is the length of the plane body (the sole), and to some extent the width of the plane iron (cutter). The four styles are: smooth W* long), jack (14"), fore (18"), and jointer (22"). Note: Although there are many variations on the length (and the width) of each bench plane, the lengths given above are the current "standards" for the two largest full-line manufacturers of steel-bodied bench planes: Stanley (U.S.) and Record Ridgeway (England). Block planes are sort of a sub-category of bench planes made specifically for planing end grain. They're also the most widely misused of all planes. Because block planes are small and relatively inexpensive, they're sold in almost every hardware store, and generally thought to be good all-purpose hand planes. However, the low pitch of the blade (about 20°) makes them ideal for their intended purpose (planing end grain), but useless as an all-around plane. selection. Of these four basic styles (lengths) of bench planes, which one is the best? The ideal situation (if you really want to get serious about this business of hand-planing) would be to have a selection of three sizes: smooth, jack, and either a fore or jointer plane. If you're not quite so serious, the best choice for an all-around plane is the jack (jack of all trades). The jack plane in our shop gets the most use by far. 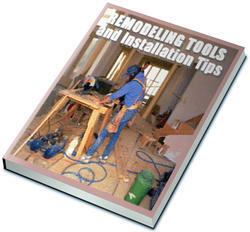 In fact, it's used for everything from smoothing down relatively small panels to planing the surface of a large table. No matter what style (length) the plane is, the key to the whole thing is that it must be properly sharpened and adjusted before it will do much of anything. In fact, a brand new plane is little more than an intricate assembly of expensive steel. In most cases it needs some work before it becomes a tool. The first step is to dismantle the plane to get all the pieces working the way they're supposed to. When you start tearing it apart, what you end up with are the five basic pieces showm in Figure 1. 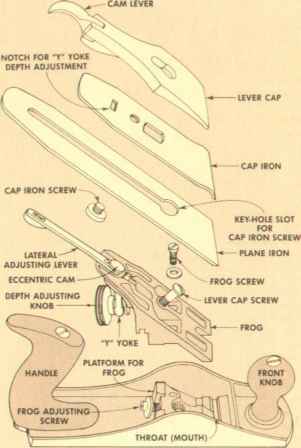 These five parts are: the lever cap, the cap iron, the plane iron, the frog, and the body of the plane. The first part of the plane that can be removed is the lever cap. This is just a large piece of nickel-plated cast iron with a cam-action lever at the top. The sole purpose of this lever cap is to hold the next two pieces (the cap iron and plane iron) firmly in place. Since that's its sole function, the lever cap doesn't seem like a big deal. But this little gizmo is the one thing that transformed the entire plane-making industry. In 1858 when Leonard Bailey patented the first cam-action lever cap to hold the plane iron in place, it replaced the old method of using a wooden wedge, and forged the way for "modern" steel-bodied planes used today. Enough history. From a functional standpoint, very little ever goes wTong with the lever cap. If anything, it only needs to be oiled for smooth action. The lever cap is held in place with the lever cap screw7 (actually it's a machine bolt). There's no need to remove this screw; its main function is as a fulcrum for the lever/cam. If the movement of the lever/cam is too loose or too tight, just loosen or tighten this screw (about a quarter turn usually does it). Before the cap iron came along, the plane iron (cutter) was one thick piece of steel that had a bad habit of chattering. The original purpose of the cap iron was to add stability to the plane iron. But the shape of the cap iron is such that it also serves as a "chipper" (as it's sometimes called, or a chipbreaker). The rounded "nose" at the end of the cap iron presents a steeper angle which breaks and deflects the shavings as they're sliced off the board. On most new planes the tip of the cap iron is not properly finished. In fact, on cheap planes, the cap iron is just a square-edged piece of steel with a bent "nose" on the business end — no further machining has been done. This causes problems. If the trailing edge (heel) of the nose is the only part that actually touches the plane iron, a small "V" cavity is created, see Fig. 2. As the shavings peel off the cutter, they jam in this cavity. The cap iron is supposed to be formed so the leading edge of the cap iron rests firmly on the cutter, and the trailing edge is slightly raised off the surface. With this shape, the shavings will deflect smoothly over the top of the "nose." To work it into shape, file a slightly negative angle at the end of the cap iron to form a pointed edge. Since a file leaves a rather rough surface, it's best to take it one step further and hone the tip (on a fine India stone) to get a smooth surface. After all this work, you may find that the tip of the cap iron no longer comes in contact with the face of the plane iron. If this happens, put the nose of the cap iron in a vise and bend it to a slightly greater arc. I try- to bend it just a little "too far" to put a little spring in the cap iron so when it's mounted to the plane iron, you'll be sure to get a good, snug fit. Before the advent of steel-bodied planes, the entire plane was made of wood . . . with the one exception: the cutter. It was only natural to call this thing the "plane iron," since it was the only metal part of the plane. Now that term can be a little confusing (but I still like to use it anyway). And to add to the confusion, it's also called a cutter or blade. No matter what you call it, the whole key to the plane iron can be summed up in one word: sharpness. If it's not sharp, the plane won't work. The next two pages are devoted to the methods we use to sharpen a plane iron (so we won't get into it here). Now we're down to the frog. The main purpose of the frog is to act as a mounting platform (with a pitch of 45°) for the plane iron and cap iron assembly The frog is attached to a raised platform on the plane body with two machine bolts (called frog screw's). These screw-s fit through two slotted holes at the base of the frog. The one problem you find with the frog is that it needs to be cleaned. Usually the sloping face (that the plane iron rests on) is coated with some sort of finish (either paint or lacquer) to protect it from rusting. More likely than not there are runs (drip marks) in this protective coating. This creates an uneven surface for the plane iron (which means the coating is doing more harm than good). I scrap off all of this coating and then use some steel wool to polish it to a smooth surface. Then to get a really good surface, I clamp the frog in a vise, and use a fine India stone to hone (flatten) the surface so the plane iron rests on a flat (unobstructed) surface. Attached to the frog are two more things that transformed the "modern" steel-bodied plane into an extremely useful tool: the depth adjusting knob, and the lateral adjusting lever. depth adjustment. The depth (vertical) adjusting knob (also invented by Leonard Bailey) is a brass knob with a Y-shaped yoke attached to it. Together, these two things allow easy and quick adjustment of the depth of cut of the plane iron. 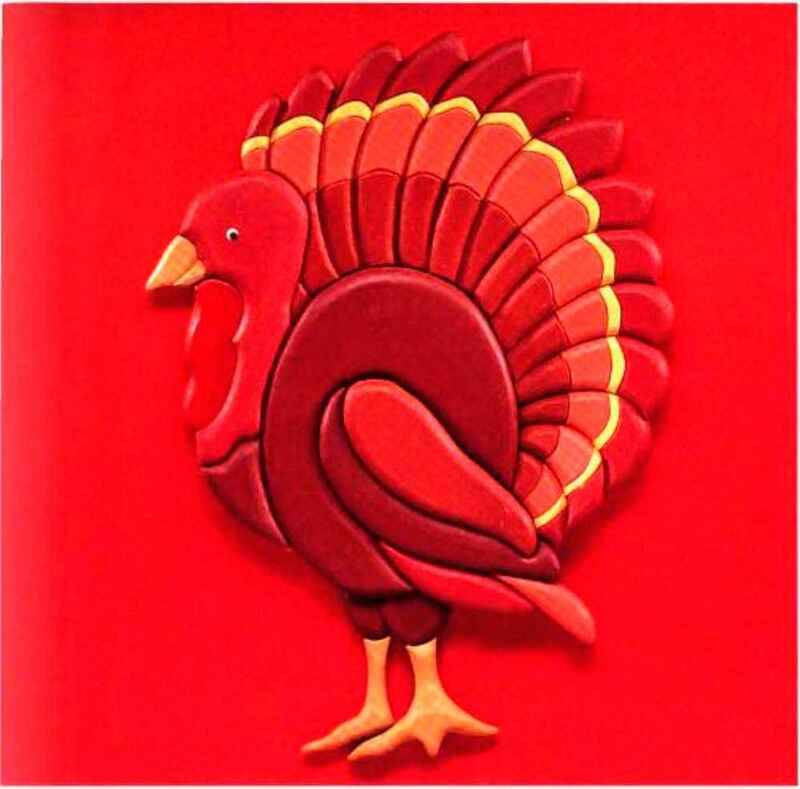 At one end of the yoke the two legs of the "Y" straddle a groove on the shank of the adjusting nut. The other end of the yoke fits in a square hole in the cap iron. As the brass knob is rotated in and out, the yoke moves the cap iron (and thus the plane iron) up and down, to adjust the depth of cut. Although this mechanical arrangement does the job it's supposed to, there is often an excessive amount of slack in it. Thus, the knob has to be rotated an inordinate amount before the yoke actually starts moving the cap iron. Some of this slack is the result of too much distance betw een the legs of the "Y" and the sides of the groove in the brass knob. To take up the slack here, remove the brass knob, and use a screwdriver to "crowbar" one leg forward (so it touches the front shoulder of the groove), and the other leg back (so it touches the back shoulder of the groove). lateral adjustment. The lateral adjusting lever (at the top of the frog) aligns the cutting edge of the plane iron so it's even with the sole of the plane. This lever is actually an eccentric (off-center) cam that fits in the "key-hole" slot of the plane iron. Not much has to be done to it, but it does enjoy a drop of oil every once in a while. Now that all the other parts have been removed, all that's left is the steel body. This is one piece of cast iron that forms the sole and sides of the plane. On some of the better planes, there's a frog adjusting screw located at the rear of the raised platform that holds the frog. As the name implies, this screw is used to adjust the position of the frog. the throat. In front of the platform for the frog is an opening in the sole of the plane called the throat (or mouth) where the plane iron pokes through. On some new-planes the front edge of this opening is out of square, or slightly rounded. Since the plane iron is often set very close to the front edge of the throat, you can run into a lot of problems trying to get the iron aligned if the throat is not perfectly straight. It should be filed down until it's both straight and square to the sides of the plane. the sole. Nowt we're down to the bottom line: the sole of the plane. On steel planes the sole can be either smooth or corrugated. A corrugated sole means that a series of grooves have been ground into the length of the sole. Presumably, these grooves reduce the amount of friction and suction betwreen the plane and the wood, thus providing a smoother (easier) planing action. No matter what kind of sole the plane has the critical thing is that it is absolutely flat. As it turns out, many planes tend to be a little on the wavy side. This is sometimes the result of poor machining at the factory, and sometimes a natural movement of the steel. If the steel has not been given enough time to cure before the sole is machined flat, the "green" steel can warp. If the sole is not flat, getting it that way can be a real hassle. It's possible to tackle this task in your shop, but it's a lot of work. We managed to flatten the bottom of one plane using the method described in Shop Notes, see page 22.